Vision enables clients to rapidly create and deploy advanced business intelligence and embedded analytics applications through a sophisticated cloud based dashboard. Analyze ﬁnancial information to better manage new payment arrangements based on an MSSP model that modulates the risk and reward equation. Ensure your ACO success by closely monitoring quality measures and drilling down to ﬁnd areas of improvement. Perform predictive analytics to improve quality moving forward. Streamline transition care among partnering organizations to ensure better patient outcomes. 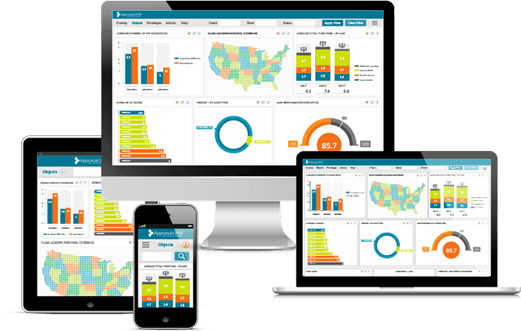 Extract speciﬁc data for the purpose of reducing the most prevalent illnesses within each ACO region. Improve patient outcomes and reduce costs by monitoring preventive care programs. Collaborate and share data with network partners, insurance companies, and regulators. Quickly and easily stay compliant with changing reporting requirements. By using Vision, a hospital team was able to implement a framework that includes the appropriate industry core competencies and insights, coupled with data contained in various systems. Together, this greatly enhanced executive control, insights, and value. In turn, the new insights gained through the use of Vision allowed the clinical groups to identify trends and other issues related to procedures, and patients. Patient outcomes, as well as overall patient satisfaction, improved dramatically. The platform is cloud hosted by Microsoft Azure making it accessible, secure and scalable for enterprises of any size.